The formula contains six letters: two ‘i‘s, two ‘a‘s, two ‘b‘s, and two numbers: a +1 and a -1. BOTH +1 and -1 are singled-out as known solutions for √+1. 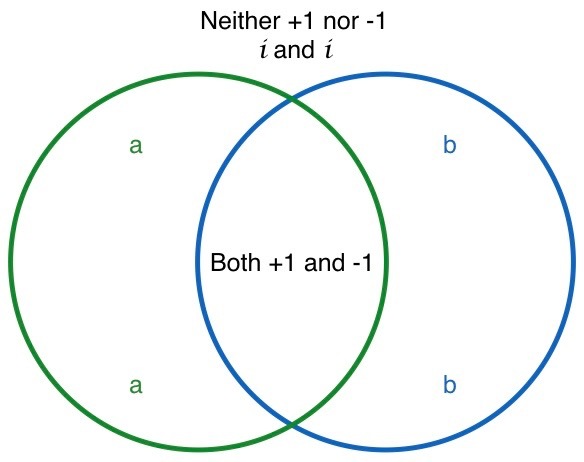 Together they BOTH are recorded in the Vesica Piscis, the area of overlap in the Pragmatic Schematic (see graphic below). The √-1 has no real solution. NEITHER positive nor negative numbers, when squared, produce a negative result. Therefore, there is no real-number square root of -1, which is why the √-1 is referred to as ‘i’ for imaginary number. Though NEITHER of the ‘i‘s alone are knowable, we do know that when i is squared, it produces a real value, -1. In other words, the ‘i‘s must be mingled-in to be realized. Mingled-in relationships occur in the metaphysical domain, above and beyond the physical domain contained within the Pragmatic Schematic. The Private Nighttime Relationship is hidden from observation; and so, befittingly, the two ‘i’s, which are imagined only but never seen, are recorded in the transcendent realm, above and beyond the Pragmatic Schematic. The ‘a’s and ‘b’s are differentiated. Two of each are recorded in the opposing crescents, which stretch between the shared interior space and the transcendent, metaphysical space beyond the bounds of confinement. The outer crescent spaces represent Transitions between two aspects, two domains or two dimensions. Murmurations of starlings, schools of fish, and herds of American bison give us opportunities to see simultaneously contiguous dimensions of holarchies. On the lower dimension, organisms are singled-out and visibly interact. On the higher dimension, they are mingled-in by the invisible force of a greater whole. At this time, you may wish to revisit the aside: The Holarchy. In the previous chapter, Dual Dimensions Seen Simultaneously, we considered the metaphor of metamorphosis. In a single lifespan, a lepidopteran lives as both a caterpillar and a butterfly. The egg and the pupa can be thought of as portals through which emerge the dual aspects of this interesting insect. The egg brings the caterpillar to its Earthly domain, and the chrysalis brings the butterfly to its Heavenly domain. Arrayed upon these crescent spaces below are the moon’s waxing and waning phases. 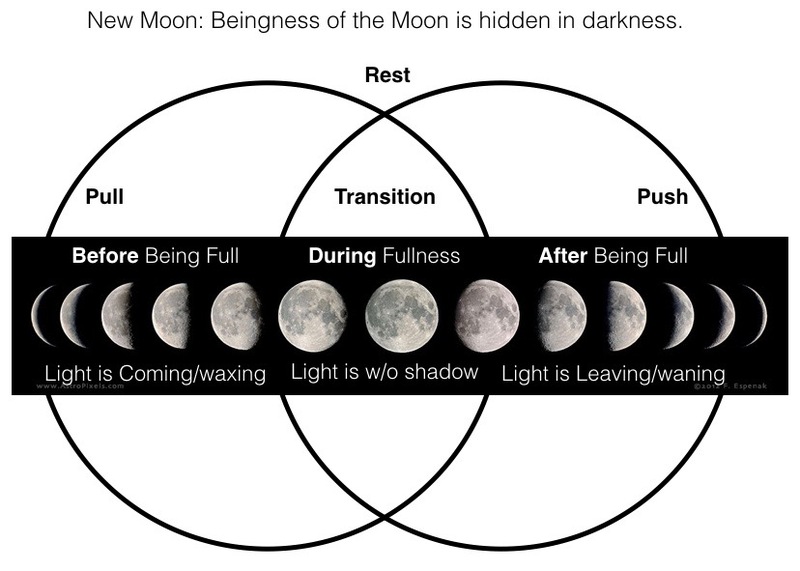 The waxing phases bring the bright full moon that keeps us awake at night, and the waning phases deliver the lonely dark sky of a new moon. The portal ‘a’ facilitates something coming into the physical dimension of the observed and observer (singled-out +1 and -1). The portal ‘b’ facilitates something leaving that lower dimension to ascend to a higher, metaphysical dimension that cannot be observed (mingled-in i and i). There is a linear progression across the Pragmatic Schematic. In the left crescent there is adding: the caterpillar grows and the moon waxes. In the right crescent, there is subtracting: the caterpillar dissolves and the moon wanes. Inside the central space of the mandorla/Vesica Piscis, this opposition produces a static, unitary value. This three-fold realm is embedded within, and transcended by, an immeasurable/metaphysical realm. To recap: The portals function oppositely within the lower realm; adding and subtracting occur on a linear dimension. The portals also serve to link two dimensions, one transcending the other; embedded dimensions involve exponential (non-linear) differences. We add to determine linear distances (one-dimensional). For example if we want to know the combined length of two sticks, each 2 feet long, we would line them up and ADD their lengths. 2 + 2 = 4 linear units of DISTANCE. We multiply to determine surface areas (two-dimensional). Instead of lining up the sticks end-to-end we can connect them at right angles. To determine the area of space contained within a square delineated by sides of length two, we would MULTIPLY the sticks’ lengths. 2 x 2 = 4 square units of AREA. Two squared is generally written as 2². The number two uniquely serves as a portal between the linear dimension (2 + 2 = 4) and the logarithmic dimension (2² = 4). To continue with my anything-but-ordinary reasoning, we will need to use exponents. Using exponents used to intimidate me, and they might be foreign to you. Just in case, I will explain in the attached Aside: Exponents Made Easy, how I came to understand exponents so that they are no longer scary. If you are comfortable with exponents, just skip the aside. Otherwise, release the tension in your neck, shoulders, and tummy; take a deep breath and click the link provided in the previous sentence. By the end of the brief aside, you will probably laugh at how easy my little tricks are and how confident you will be from now on when you encounter a number written in scientific notation. Because we know that 2 + 2 = 2 x 2, we know there is a number (two), that when added to itself produces the square of itself. With our understanding of exponents, we can report this fact as n¹ + n = n² so that other mathematicians can solve for ‘n’ and discover that 2 is the only value possible for n, given that n + n = n x n.
Now, using ordinary ‘if-then’ reasoning, we wonder: IF the bold equation above discloses a numerical bridge between one-dimensionality and two-dimensionality, THEN would a similar equation with stepped-up exponents reveal the numerical value of a bridge, or portal, between the second and third dimensions/domains? All holons are Particularities comprising visible/physical Parts and Participating with an invisible/metaphysical collective consciousness. The dream-time formula’s variables ‘a’ and ‘b’ serve as portals between the realm of metaphysical Patterns (INformation is 2D) and the realm of physical Matter (OUTformation is 3D). It is one thing to recognize that interposed between dimensions are functional portals, as examples of this are easily found. However, it remains to be seen what doors may open by solving for the numerical values of the variables ‘a’ and ‘b’! Will evidence be found that these numerical values actually organize, influence, or even pertain to the complex dynamics of our conscious corporeal existence? Well, as it turns out, these numerical values are related to an aesthetically exquisite proportion, considered throughout the ages to be sacred and even called “golden” and “divine”. Those relative few who have been privy to the proportion’s profundity have used it to achieve the quality of timelessness in their artistic masterpieces and architectural wonders. Of course, Mother Nature uses this proportion ubiquitously. Even so, we must have the eyes to see. To fully comprehend the significance of our portal values (and as a special reward for tolerating the quadratic formula), our next chapter will provide a scenic detour. Through numerous narrated slide shows we will explore some awesome properties of the two solutions. After enjoying the provocative presentations of the next chapter, we will use the knowledge gleaned from it and this chapter to establish Quadernity’s Nature-Based Number Line, and layout the benefits derived from it. But first, let’s take our Detour into Magical, Mystical Mythematics!